On April 3rd WBE Canada held its first “Breakfast with Brands” event of 2019 by bringing together certified women-owned businesses and buyers from WBE Canada Corporate Member organizations in the Financial sector. Breakfast With Brands: Financial Industry was hosted by RBC at their offices on Wellington Street in Toronto. WBE Canada’s Breakfast with Brands events are designed to be educational and informative, providing greater access to procurement networks for women-owned businesses looking to succeed in corporate supply chains. Breakfast with Brands events target specific industry sectors, introducing WBEs to corporate leaders and procurement professionals creating a unique opportunity to create relationships and do business. WBE Canada member corporations participating in Breakfast with Brands: Financial Industry included RBC, BDC, BMO, CIBC, Sun Life Financial and TD Bank with 19 buyers meeting over 30 WBEs with a range of opportunities including HR, IT, Corporate Real Estate, Event Support, Legal, Construction and Marketing/Communications. Designed as a “closed-door” event, only WBE Canada Corporate Members and Certified WBEs were able to take advantage of this event – exemplifying the value of certification and corporate membership. 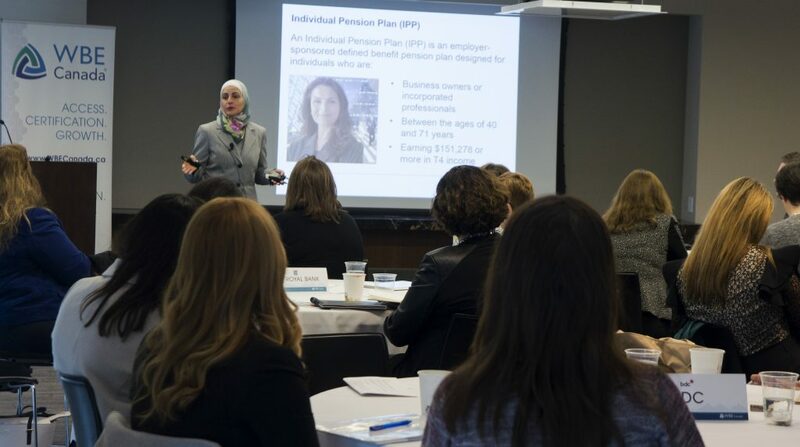 Attendees also had the opportunity to hear featured keynote speaker Abby Kassar, Vice President, High Net Worth Planning Services, RBC on the topic of “Wealth Planning for Women Entrepreneurs”. Ms. Kassar’s message: Women entrepreneurs are not only increasingly generating and managing wealth but they are taking a greater role in making financial decision and are becoming the primary household decision maker. She highlighted the important financial considerations every woman entrepreneur should be aware of including retirement planning alternatives, estate planning essentials and contingent planning solutions. One of our Certified WBEs who attended WBE Canada’s 2019 Financial event connected with a buyer in the room, followed up and received a 3-year long contract… within 2 weeks! This is what we call a champagne moment. Congratulations! Thank you to all who attended Breakfast with Brands: Financial and we look forward to seeing everyone at future WBE Canada events. Thank you RBC for hosting this event! To learn more about WBE Certification and how it can help your woman-owned business, click here.